The jury was very impressed by the holistic nature and high impact of the work of the Biovision Foundation “on the ground“. The projects in Africa are each and by themselves promising and hope-giving success stories. Many experiences made in the projects are ready for major, if not massive role out - not only in Africa. The jury appreciated very much the bridge building role of the foundation being a voice of Africa in the North and opening windows to Africa of the North“. Behind all this is the personality of Hans Herren who as founder of the Biovision Foundation not only had the vision for the Foundation, but also stays “at the helm“ as president. Apart from the remarkable achievements that have been realized over decades, the central role that Hans Herren played in the IAASTD World Agriculture Report was yet another important reason for the jury to choose him as OWA laureate. With this award the jury sends a clear message of support and encouragement to give not only much more attention to the report, but also to start making use of the findings and conclusions of the report for concrete steps towards the needed paradigm shift from an environment-destroying, dependency-creating and resource-consuming, conventional form of agriculture towards a sustainable and ecological way of producing our food all over the world. The unanimously elected OWA laureates also send a clear message with regard to the highly potential solutions that Africa can offer for solving major problems - even beyond Africa. Out of this and with respect for the fundamental role African people play in the various projects, the jury had decided to honor on behalf of all these encouraging “future makers“ one of the pioneering push and pull women farmers as an additional laureate. Rachel Agola is an inspiring example of women power and the leading role that women play in farming worldwide. 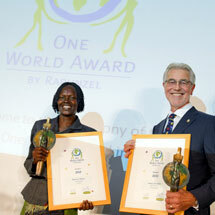 A visionary scientist, a dedicated woman farmer and an outstanding foundation together have not only deserved the One World Award 2010, but will take the wings of “Lady OWA“ to continue providing a highly substantial range of sustainable solutions for the protection of another earth, our environment and for fair livelihoods.